This steamed dumpling is stuffed with filet mignon, shiitake and button mushrooms, bell peppers and served with a spicy sesame Rayu butter sauce. Based on this description it sounds like a fabulously original dumpling, but it tasted like one from your neighborhood Chinese restaurant. The outside of the dumpling was kind of chewy too. 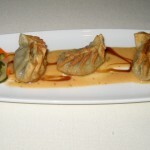 For an upscale restaurant that charges $10 for four dumplings, we expected much more. Not only was the “spicy” sauce not spicy, it had very little flavor. 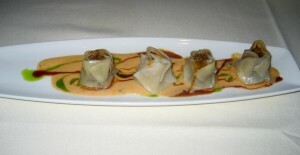 Fried lobster dumplings served with a spicy Togarashi miso butter sauce. Even though this one is lobster and the previous one was beef tenderloin, it almost felt like we were eating the same dish. This is is fried which, obviously, made it taste a tad better. Similar to the other dumplings, this sauce was flavorless and and nearly identical. If you are looking for an above average appetizer, definitely skip out on these two. 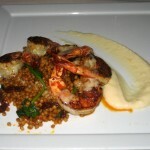 Tiger shrimp served with a side of couscous and smoky potato puree. Finally, some uniqueness that we hoped for in our meal. The couscous is not your common North African one, but an Israeli type. This difference is that these are small, round, semolina pasta balls which are addictive due to their taste and fun texture. It also included yummy sundried tomatoes and some spinach. Although plain, the potato puree was a nice addition. The dish included five large pieces of shrimp. The flavor was excellent and did not need any sauce, however some of the pieces were very chewy. These things were so overcooked it felt like we were sinking our teeth into a rubber…eww! If it was not for that, this dish would have received a higher rating. This mahi mahi is cooked with a lobster-cognac cream sauce and comes with small side of asparagus and a few sliced potatoes. The fish was overcooked and tasted dry, not juicy. On top of that, it was not only pretty bland but kind of bitter too. The glaze on top looked promising but lacked flavor! The asparagus was soggy and slightly bitter as well. The cream sauce added nothing special to this dish. This mahi mahi has probably seen better days, but today wasn’t one of them. 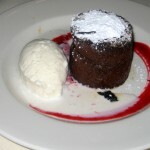 Flourless Chocolate Cake with a Molten Hot Center served à la Mode with vanilla bean ice cream. This souffle will have you singing with joy by the time you finish it. The outside was soft and moist and the inside was piping hot, with a rich chocolatey taste. Not only did it taste great, but much to our surprise there was a lot of it too! Each bite was like putting a tiny piece of heaven in our mouth. The ice cream was a little plain and didnt have much vanilla flavor to it, much less vanilla bean. Overall, this is one of the best souffles/molten lava cakes we’ve had in Austin. This was served with brown butter ice cream. The tart was rather on the dry side, probably because of the macadamia nuts. It had a decent flavor but the texture made it difficult to enjoy thoroughly. We wouldn’t have minded if this dessert were garnished with berries or some kind of sauce. On the bright side, the deliciously rich and creamy ice cream helped us wash the tart down. Imagine pairing the chocolate souffle with brown butter ice cream – now there’s an image to drool over! 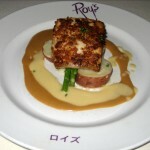 We dined at Roy’s during the busy Restaurant Week so we made reservations in advance. When we entered, we were greeted by our friendly hostess and taken to our table right away. Our waiter immediately came over and introduced himself and took our drink orders. We were very impressed by our waiter since he was personable and knowledgeable about the menu. He checked up on us at appropriate times and our waters were topped-off throughout our meal. At one point, the manager made his rounds and asked us about our meal. We were honest and told him that our Mahi Mahi dish was not to our liking and he offered to bring us some more Tiger Shrimp since we enjoyed it so much. We appreciated the offer, but declined since our bellies were full. 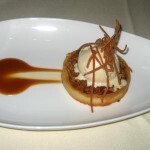 When the bill came, we noticed that we weren’t charged for the Mahi Mahi and one of our desserts – we were shocked! We were very impressed that the manager took care of like this on his own. It’s too bad that the food here isn’t better because the service is top-notch, easily one of the best in Austin. Roy’s is located in the heart of Downtown, adjacent to the Convention Center. From a block a way, you can spot the tiki torches that light up the patio area preparing you for this Hawaiian-themed eatery. However, this is where the theme stops. The interior is dimly-lit, romantic, and upscale with little or no Hawaiian themed decor. Even the food selection for the most part is that of an ordinary seafood restaurant rather than unique and exotic. The restaurant is designed as one large room with very high ceilings. There is a bar area where you can grab a drink and catch the big game on the TV. The main dining area has plenty of booth and chair seating available. However, the tables are all close together giving no privacy as you dine. It is worth noting that the kitchen is in full-view, so patrons can watch the chefs in action! The restaurant is good for couples as well as small groups. Since it is located downtown, street parking can be difficult but valet is available.